The Red Bulls used two second half goals, including a big one from Bradley Wright-Phillips, to get by the New England Revolution, 2-0, on Saturday night at Red Bull Arena. The Red Bulls have won back-to-back matches and five of their last six, and they have captured 25 of the possible 30 points at Red Bull Arena and have outscored their opponents, 25-6. The Red Bulls improved to 12-5-2, with 38 points, in third place in the Eastern Conference. They are now two points behind NYCFC, who are off this weekend, for second place. The game was scoreless until the 69th minute when Daniel Royer gave the Red Bulls the lead when he scored on a feed from Marc Rzatkowski on a set piece. This was Royer's fifth goal of the season and first game-winning tally of 2018. The Austrian winger has tallied six career league game-winners and is one shy of breaking the franchise's top-ten in game-winning goals. Red Bulls Head Coach Chris Armas said of Royer's goal, "Yeah, you know, Danny does a good job operating on the back post. His timing is always excellent and he has a good knack for being around the goal. We've seen that many times now. "Marc, we know, serves a great ball. That's why we have him on a lot of set pieces. He's around the ball a lot and he whips in a good ball and Danny sniffs it out. It's not lucky, really. Danny has a knack and puts himself in a good spot and gets good timing and varies it. Great for him." The Red Bulls doubled their lead in the 80th minute when Kaku lofted a pass, from outside the box, to Bradley Wright-Phillips, who headed end the insurance goal to the near post. 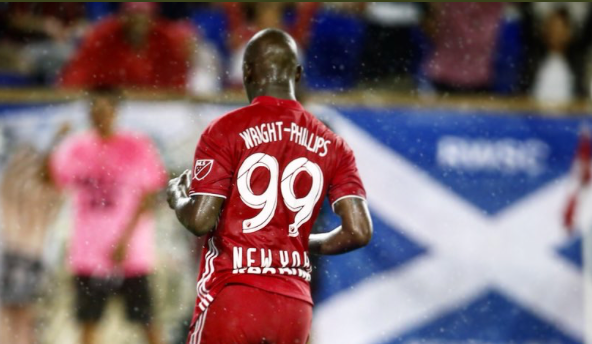 Wright-Phillips is very close to a major milestone, as he is now one goal shy of 100 league goals as he tallied his 99th career MLS goal. He also raised his career all competitions goals to 117. BWP has tallied a goal in back-to-back league matches and five goals in the seven matches across all competitions. Kaku remained atop the league in assists as he raised his season total to 12. Rzatkowski raised his season assist total to four and has tallied a point in back-to-back games. "Marc shows, again, that he's a good player," Armas said of Rzatkowski. "He plays with a lot of confidence. He's a smart, intelligence player. He plays against the ball. He steps to plays. He was so comfortable on the ball and he can make final plays, as we saw, again, tonight. Yeah, I'm real happy to see his performance just solid all night." Red Bulls goalkeeper and captain Luis Robles needed just one save to record his 55th career clean sheet. Robles recorded his sixth shutout in 2018 and moved into a tie for fifth place. Armas is now 2-1 since taking over for Jesse Marsch, and he said of how Royer's goal opened the game up, "Yeah, look, like you said the first half was a little bit in the balance, back and forth. It's two teams, probably the only team in the League that plays closest like us and us like them. "Yeah, the key was to be able to put together a play and not get too frustrated and that was a little bit the message at half time. So I think once again, our guys -- actually, I thought we started the game in a good way and then we started the second half in a good way. "Just to stay with it is a reminder and to not get frustrated and to keep being us and to keep doing the things that make us good." The Red Bulls remained unbeaten against New England at Red Bull Arena as the streak stretched to ten matches (9-0-1). The Red Bulls hits the road for just their second mid-week matchup on Wednesday, July 25 as they face Atlantic Cup rival D.C. United at new Audi Field.